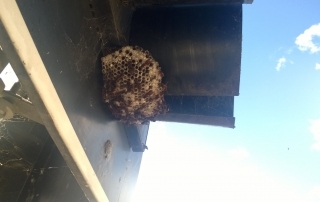 We do not recommend the public treating European wasp nests, always engage a qualified Pest Controller. The European wasp is an aggressive stinging insect. European wasps are bright yellow and have a black banded abdomen, and a pair of black spots on each yellow band. European wasps have two pairs of clear wings with the first pair larger. They have black antennae and fly with their legs held close to the body. Their size is between 12–16mm. European wasp colonies are started in spring by a single fertilised queen, which lays an egg in a number of cells in the nest. These hatch into grub-like larvae and are tended by the queen for a number of weeks. They become the first batch of workers that take over nest construction and rearing of the larvae while the queen concentrates on laying eggs. 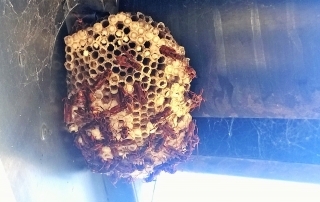 The queen will not leave the nest again, she will communicate to her workers/nest via a pheromone. 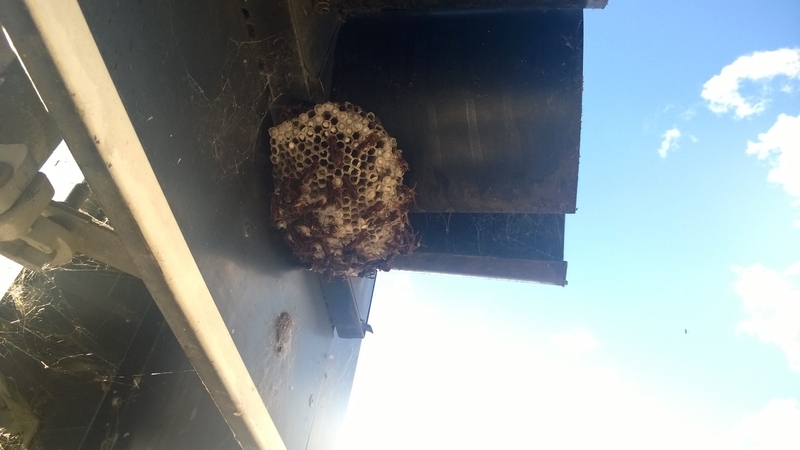 The nest grows throughout the summer until a batch of males and new queens are hatched in the autumn. They mate, the males will die and the queen will find a suitable site to hibernate for the winter. In the spring, the queen will re-emerge, feed on carbohydrates/nectar and will begin her new colony. In Europe the nest then disintegrates, but in Australia’s warm climate the nest can continue to grow over a number of seasons. 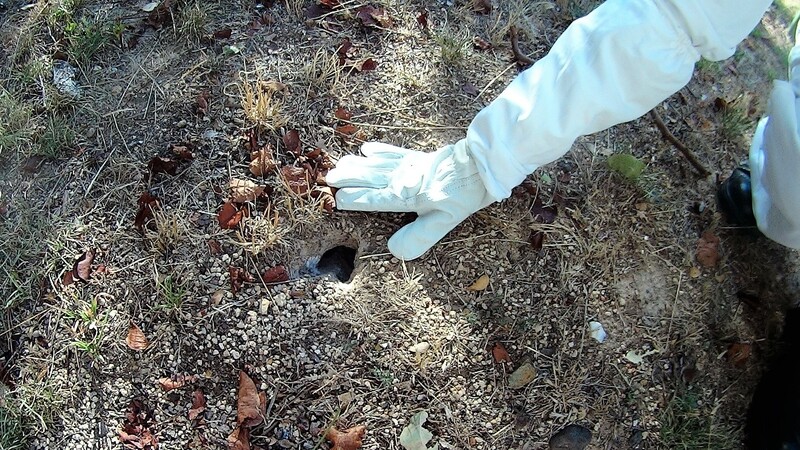 This results in giant and potentially dangerous nests of over 100,000 wasps. 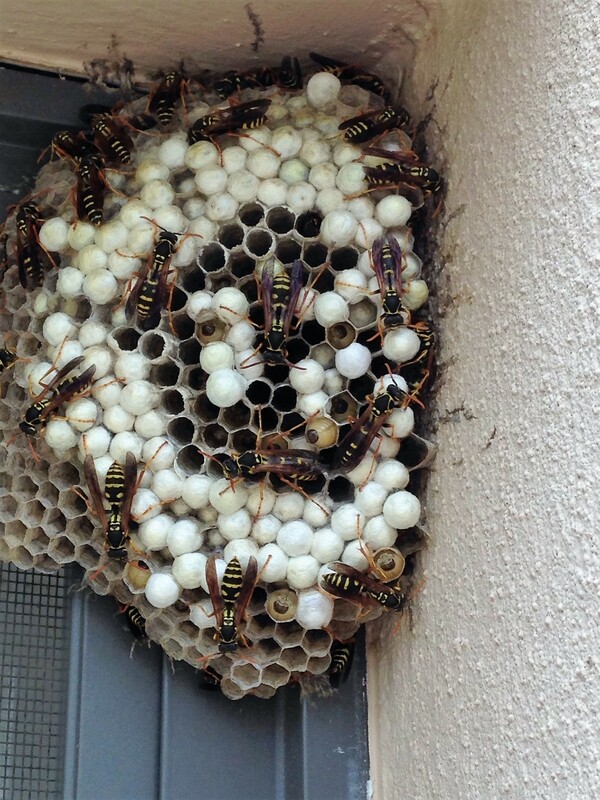 Most nests have an average of 5,000 – 7,000 wasps. 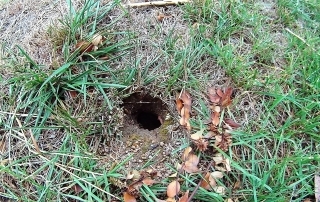 European wasps are found in large communal nests, normally only visible as a small entrance hole. 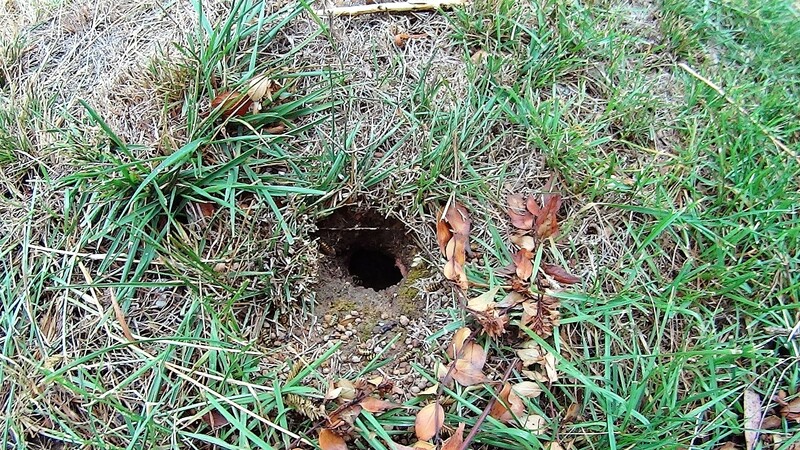 Nests are normally built either underground or in cavities in walls, ceilings, logs or trees. Nests are made out of chewed wood fibre. Workers leave the nest in search of food, and are attracted to meats, sweet food and drink. Foraging range for a European wasp worker can be up to 1.2km from the nest. The European wasp is a native of Europe, North Africa and Asia Minor. In Australia, the first European Wasps were found in Tasmania in 1959. By 1978 they had also been found in Victoria, South Australia, New South Wales, Western Australia and Queensland (confirmed by Biosecurity Queensland). They are now firmly established in all these areas. 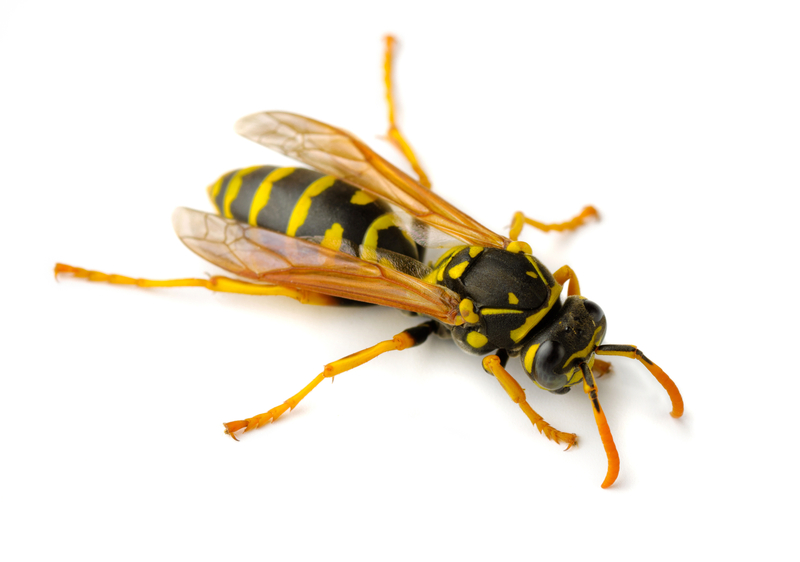 The European wasp has a nasty sting, they can sting multiple times. They are a nuisance to people’s homes and gardens, public places such as BBQ areas, cafes/restaurants and fresh food markets. They are in search of rich protein foods to feed their larvae, such as pet food, meat from BBQs and picnics as well as insects and spiders. 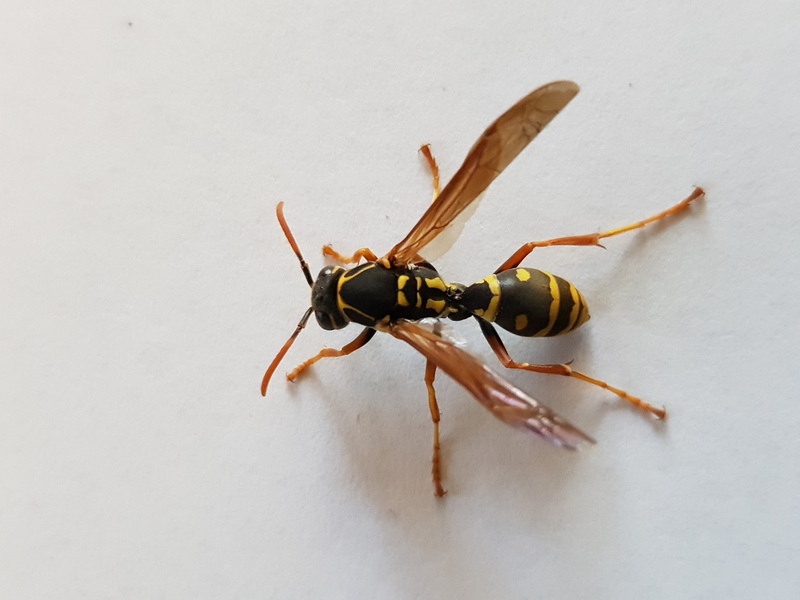 European wasps have a negative impact on the environment due to the large number of insects and spiders they consume, this in turn puts pressure on our native insects and birds as food becomes scarce. If threatened or the nest is disturbed, European wasps emit an alarm pheromone summoning the rest of the colony to attack! In some individuals, wasp, bee and ant stings can cause an allergic reaction (anaphylaxis), but this is relatively uncommon. Effective treatment is available, which involves known bee/ant/wasp sting allergy sufferers carrying a special kit when outdoors. Immunotherapy or desensitisation is also available, and can reduce the severity of the allergy. Seven deaths over a twenty-year period attributed to wasp stings have been recorded in Australia, mainly amongst known allergy sufferers who were not carrying their preventative medicine with them. A cold pack may be used to relieve the pain of the sting. If there is evidence of a more severe reaction or the sting victim is known to be allergic to wasp and bee venom, medical attention should be sought immediately. Please report all European wasp nests to the European Wasp Hotline. 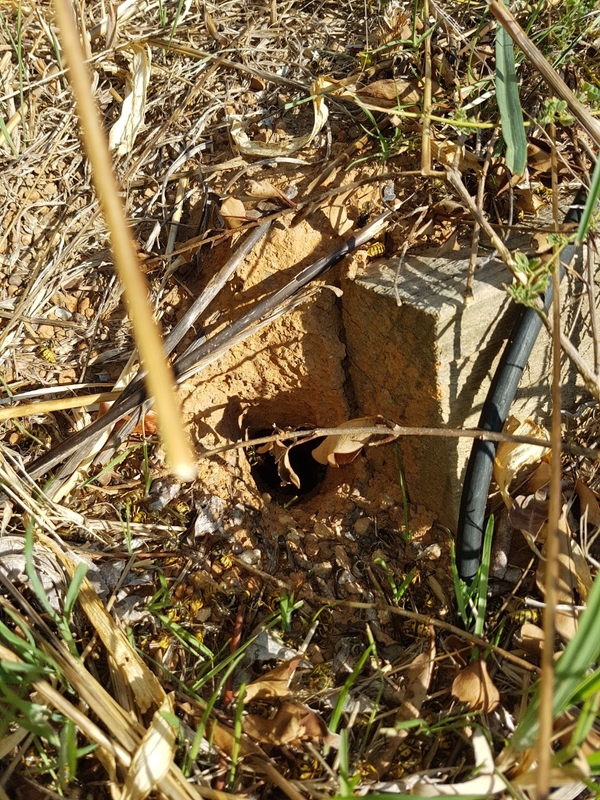 By reporting, we are able to monitor the distribution of European wasps through urban and bush land areas and how they are affecting the native species of both prey and predator. For the research to be successful, we rely heavily on the public reporting all European wasp nests to the hotline. 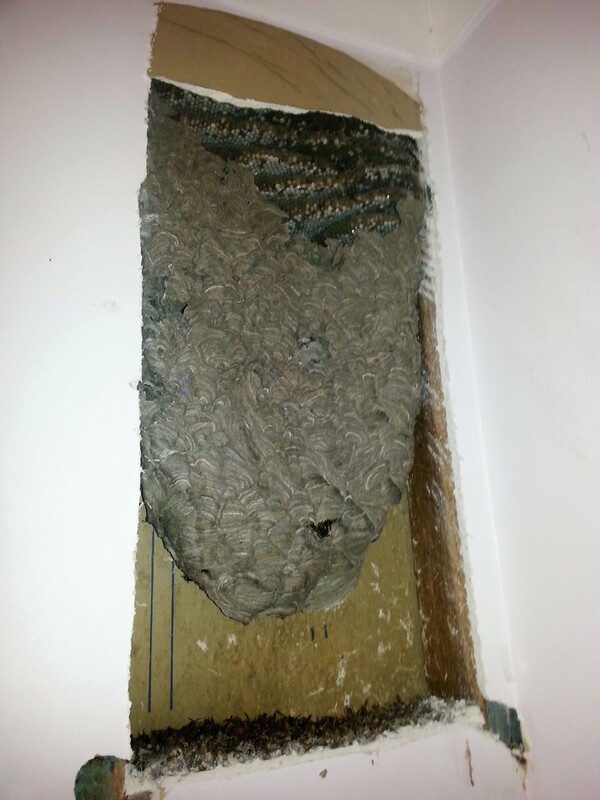 We do not recommend the public treating European wasp nests. 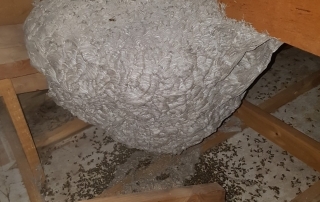 Most DIY methods fail resulting in stinging incidences and causing the nest to become more aggressive. Unapproved baiting methods are illegal in Australia. To conduct a baiting program, you must obtain a permit from the Australian Pesticide & Veterinary Medicines Authority (APVMA). 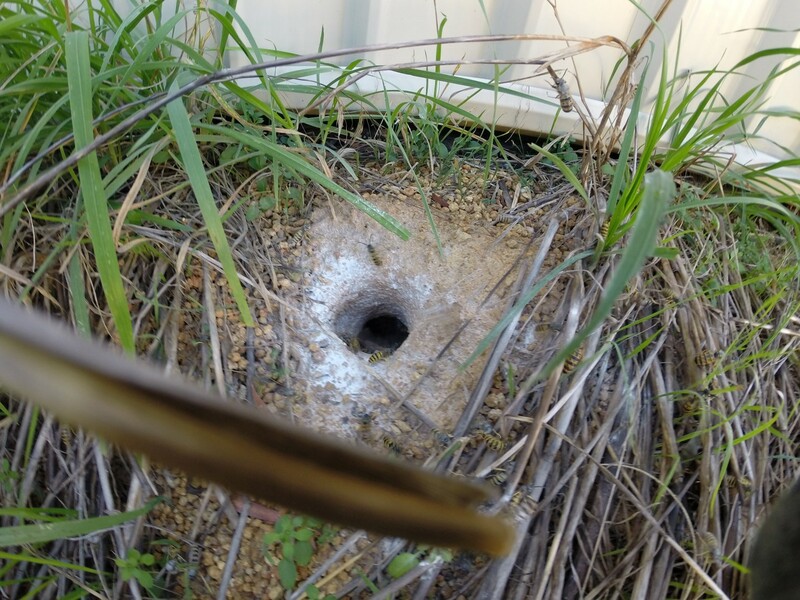 The use of honey based baiting systems is illegal in all States and Territories of Australia. For nest reporting, advice and treatment/removal, contact the European Wasp Hotline via phone, website/email or eWasp mobile app. Asian Paper wasps have a small head, with medium sized eyes and medium length antennae. The paper wasps body is slender, with a very narrow waist. The wings are reddish amber brown. The abdomen is reddish brown with yellow rings, the body is a reddish brown to black with long bright yellow legs. The Asian paper wasp grows between 13– 25mm in length. Over-wintering female wasps emerge in spring and begin nest cell construction and egg laying. The first broods (a number of young produced or hatched at one time) to emerge in late spring or early summer are only females. There is no clear difference in workers and the queen, even small ones, are potentially fertile. Egg production in a colony is dominated by one or a few females. Male wasps are particularly noticeable in early autumn when they perform distinctive courtship behaviour. Males are produced from early summer onwards, and following that, no more females are produced for the season. 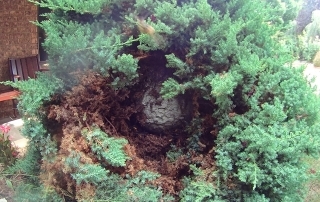 Maximum nest size 10 cm – 12 cm. 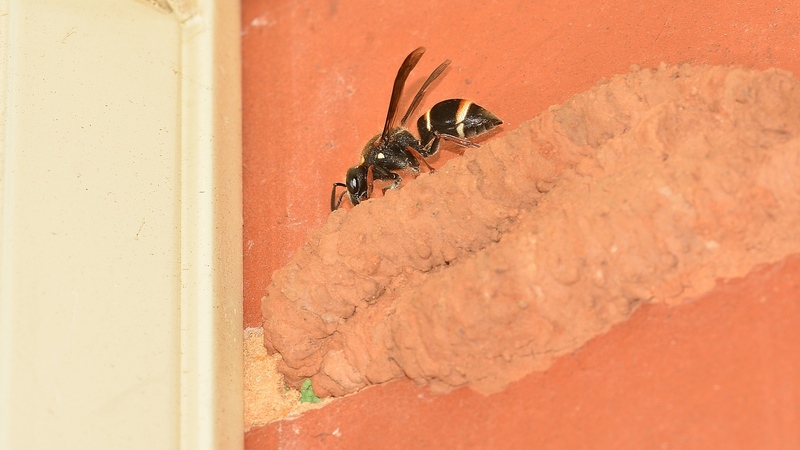 Nests can grow to twice the size of a Native paper wasp nest. The Asian paper wasp may consume a considerable amount of invertebrate prey, putting prey species at risk of population decline, and indirectly threatening native predatory insects (native invertebrate such as the paper wasps and spiders) by exerting competitive pressures on them (this may include native reptile species). The Asian paper wasp may compete with honey bees and native bird species for honeydew and nectar. 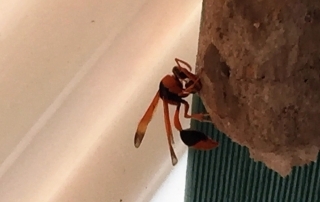 The Asian paper wasp is an invasive species and a significant public nuisance, stinging people when it is disturbed and constructing its nest under house eaves, fence posts and dense shrubs. Asian paper wasps can deliver painful stings and a cold pack may be used to relieve the pain. If there is evidence of a more severe reaction or the sting victim is known to be allergic to wasp and bee venom, seek immediate medical attention. Please report all Asian paper wasp nests to the European Wasp Hotline. 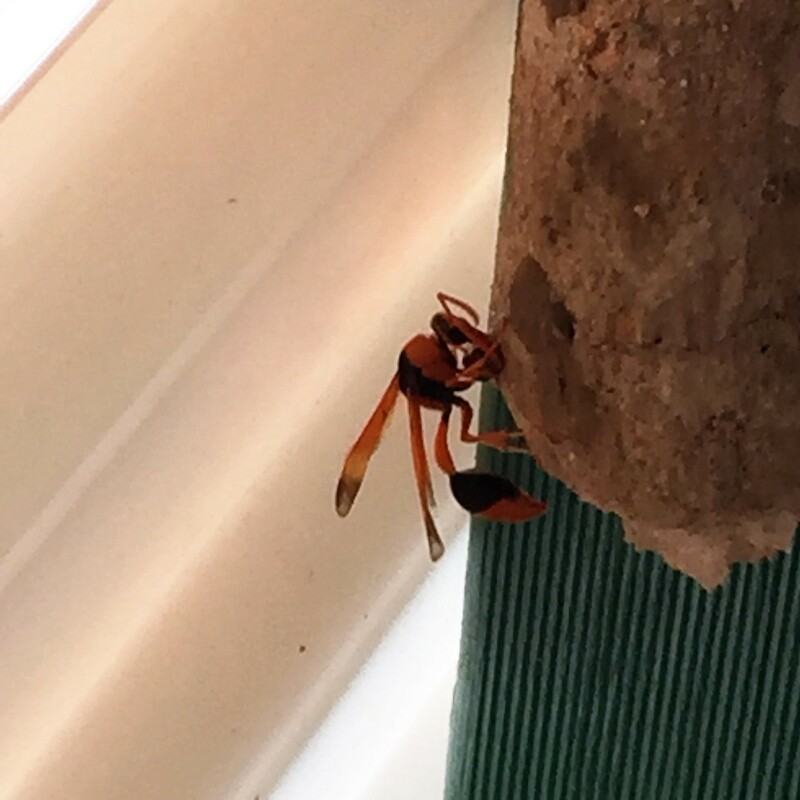 By reporting, we are able to monitor the distribution of the Asian paper wasp through urban areas and how they are affecting the native species of both prey and predator. For the research to be successful, we rely heavily on the public reporting all Asian paper wasp nests. Note: When using a registered pesticide, always follow the directions on the label. If poisoning occurs, contact the Poisons Information Centre on 131126. 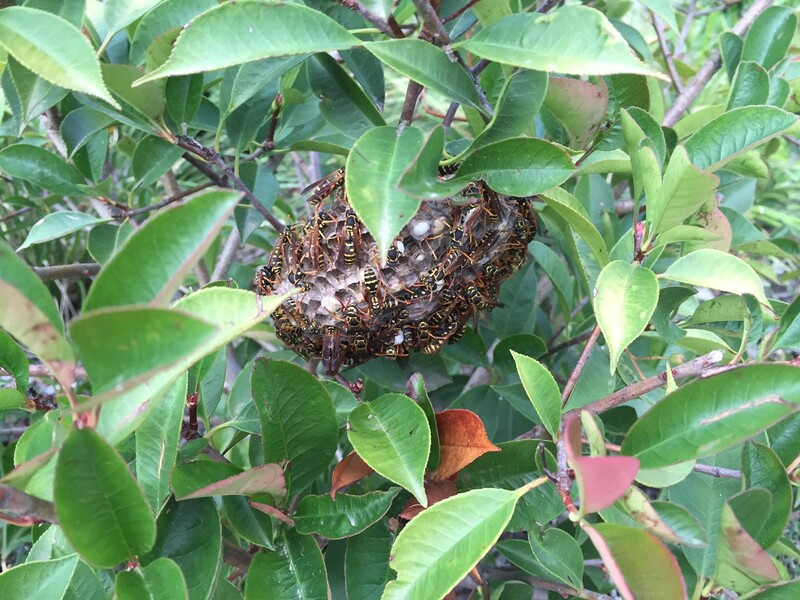 Late summer and early autumn the Asian paper wasp nest can have up to 100 wasps in the nest and are more aggressive in defending their nest. It’s recommended that you seek a professional Pest Controller to treat an Asian paper wasp nest during these months. 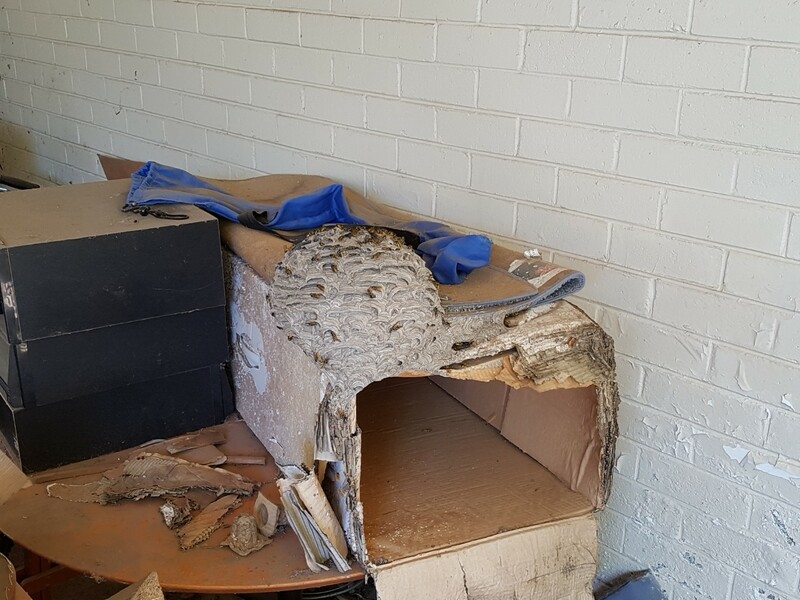 Always seek professional advice before treating wasps or nests, do not treat wasps or nests if you are allergic to bees or wasps. Always use a register can of insecticide, the can must have wasp symbol/image on it. 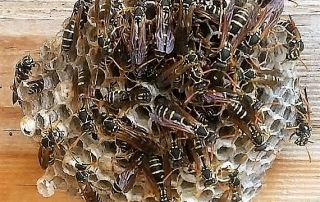 The best time to treat Asian paper wasps or the nest is late in the evening when all the wasps are on the nest and activity is low, they are most calm at this time. 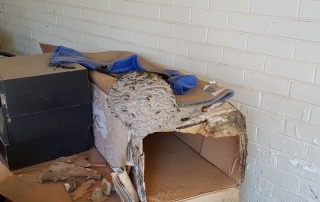 Wear protective clothing when treating a Asian paper wasp nest, protective clothing includes a bee veil, hat, long sleeved overalls or long pants, long sleeved jumper/hoodie, gloves and protective eye wear. 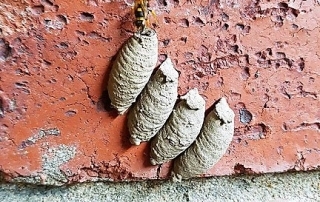 Wind should always be coming from behind you, and blowing towards the Asian paper wasps or the nest, holding the registered can of insecticide in an upright position, stand a safe distance from the Asian paper wasp nest and not directly underneath the nest, the spray should reach the nest. Spray using a sweeping motion to saturate the nest. 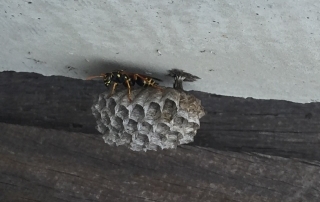 When the Asian paper wasps are dead, you can remove the nest by hosing it down or knock it down with a stick. European Paper wasps have a small head, with medium sized eyes and medium length yellow antennae. The European paper wasps’ body is slender, with a very narrow waist. The wings are reddish amber brown. The abdomen is black with yellow rings/stripes and long bright yellow legs. The European paper wasp grows between 15–25mm in length. The European paper wasp may consume a considerable amount of invertebrate prey, putting prey species at risk of population decline, and indirectly threatening native predatory insects (native invertebrate such as the paper wasps and spiders) by exerting competitive pressures on them (this may include native reptile species). The European paper wasp may compete with honey bees and native bird species for honeydew and nectar. The European paper wasp is an invasive species and a significant public nuisance, stinging people when it is disturbed and constructing its nest under house eaves, fence posts and dense shrubs. European paper wasps can deliver painful stings and a cold pack may be used to relieve the pain. If there is evidence of a more severe reaction or the sting victim is known to be allergic to wasp and bee venom, seek immediate medical attention. Late summer and early autumn the European paper wasp nest can have up to 60 wasps in the nest and are more aggressive in defending their nest. 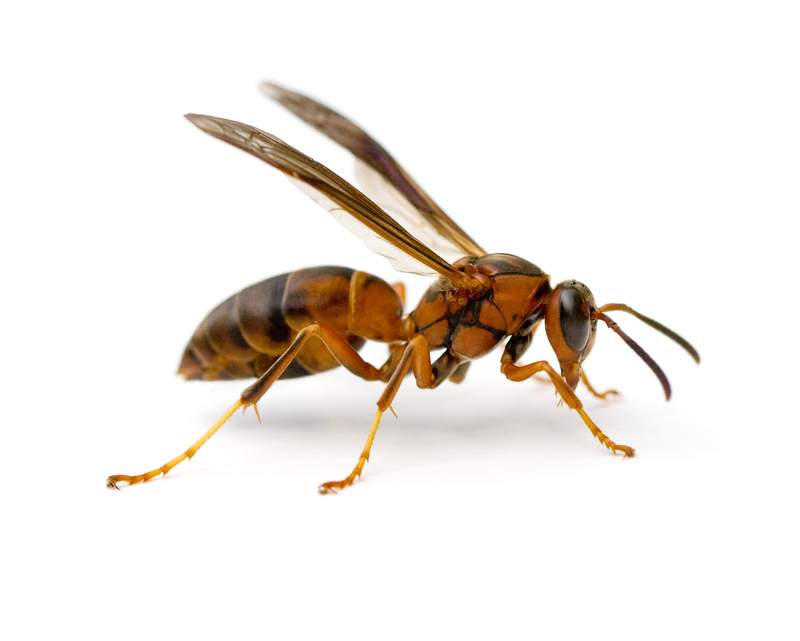 It’s recommended that you seek a professional Pest Controller to treat a European paper wasp nest during these months. Always use a register can of insecticide that has the wasp symbol/image on it. 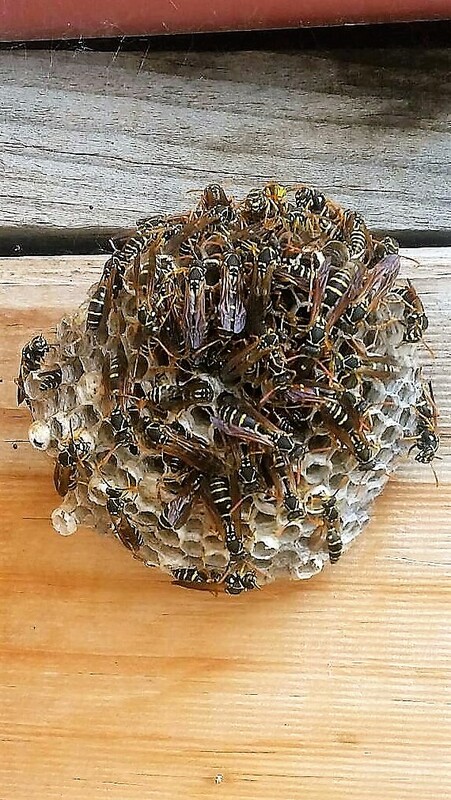 The best time to treat European paper wasps or the nest is late in the evening when all the wasps are on the nest and activity is low, they are most calm at this time. 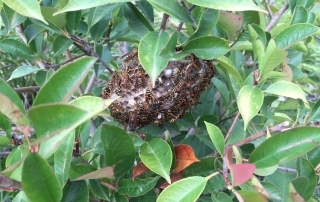 Wear protective clothing when treating a European paper wasp nest, protective clothing includes a bee veil, hat, long sleeved overalls or long pants, long sleeved jumper/hoodie, gloves and protective eye wear. 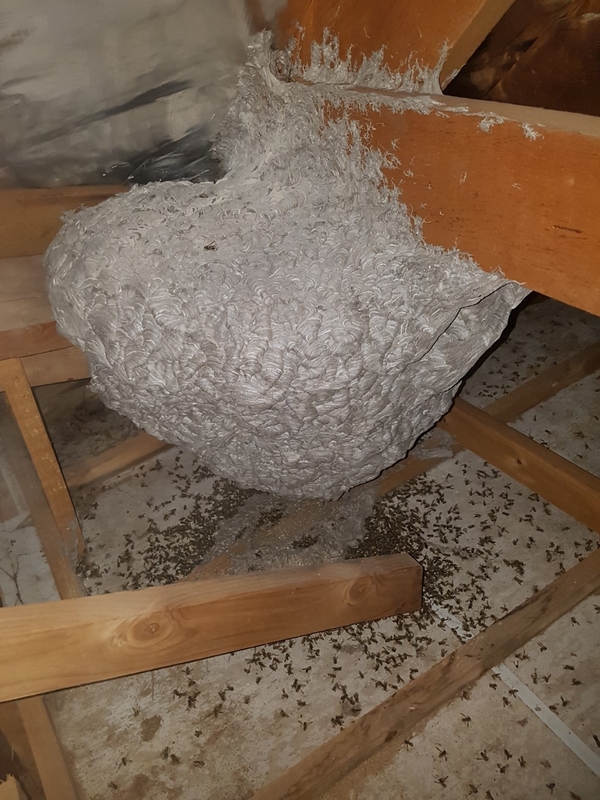 Wind should always be coming from behind you and blowing towards the European paper wasps or the nest, holding the registered can of insecticide in an upright position, stand a safe distance from the European paper wasp nest and not directly underneath the nest, the spray should reach the nest. Spray using a sweeping motion to saturate the nest. 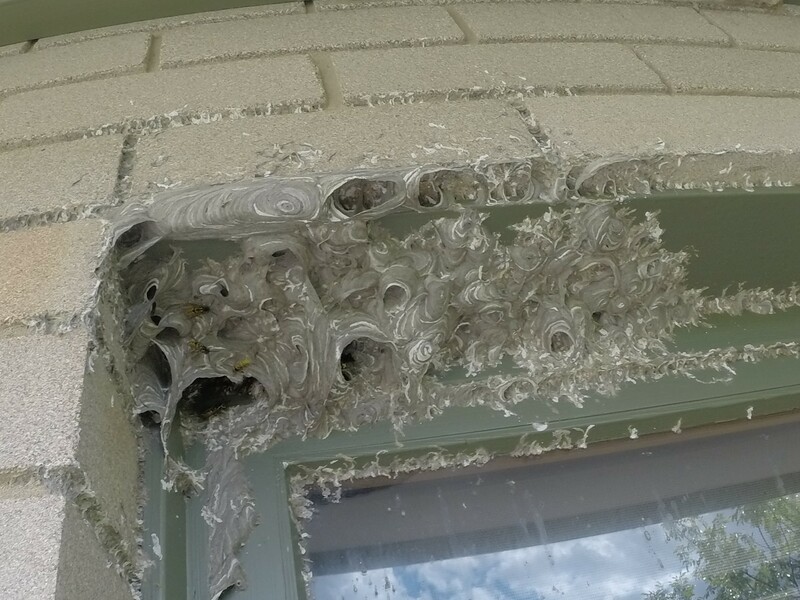 When the European paper wasps are dead, you can remove the nest by hosing it down or knock it down with a stick. There are about 35 different paper wasp species native to Australia. Paper wasps have a small head, with medium sized eyes and medium length antennae. The paper wasps body is slender, with a very narrow waist. There are two pairs of brown-tinted wings, with the first pair larger. The abdomen has some yellow/orange bands, but is mainly black. The Paper Wasp grows between 10-22mm in length. 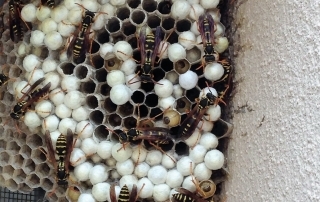 Nests contain s 12 – 20 Paper Wasps. Adult paper wasps catch caterpillars to feed their larvae, but the adults themselves feed on nectar. 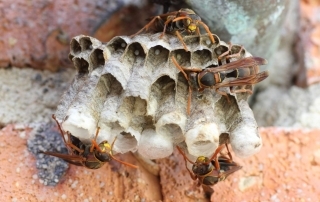 The nest of the paper wasp is a series of cells shaped like an inverted cone. The nest is make from saliva mixed with wood fragments. 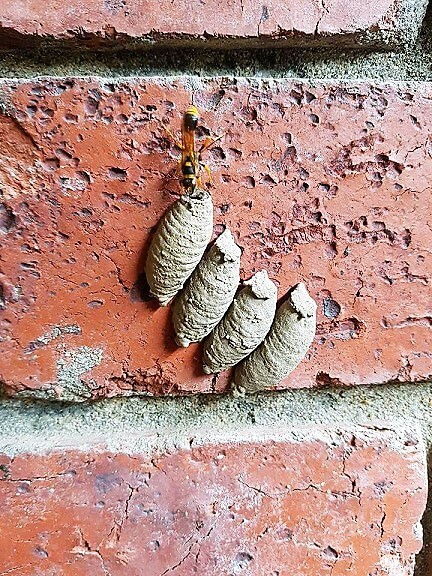 When it dries, the mixture is quite paper-like, which gives these wasps their name. The Native paper wasps tend to only be aggressive when defending their nests but are otherwise beneficial insects to have around the garden. Paper wasps can deliver painful stings and a cold pack may be used to relieve the pain. If there is evidence of a more severe reaction or the sting victim is known to be allergic to wasp and bee venom, seek immediate medical attention. The Native paper wasp is beneficial to the environment as they control spiders, aphids and other pest insects. If the nest is not in a high traffic area or no one in the household is allergic to bees and wasps, they are good to have around. 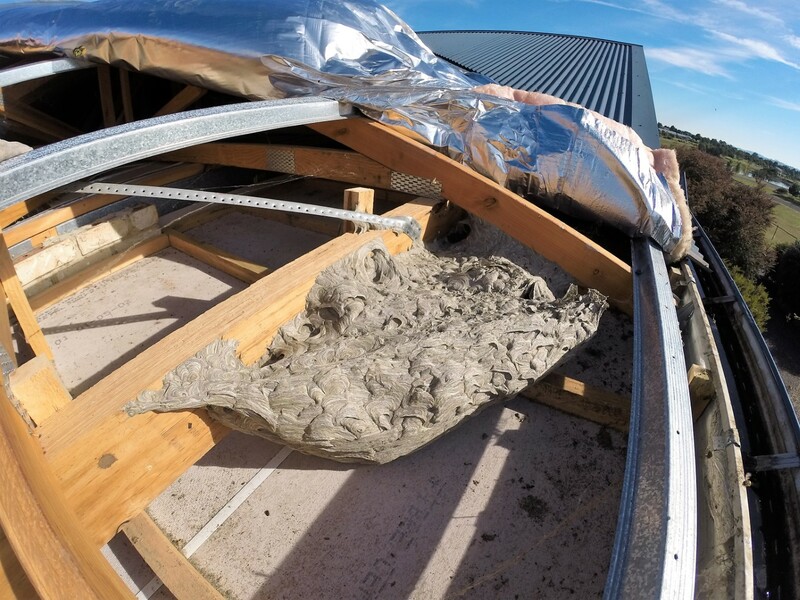 Late summer and early autumn the Native paper nest can have up to 30 wasps in the nest and are more aggressive in defending their nest. 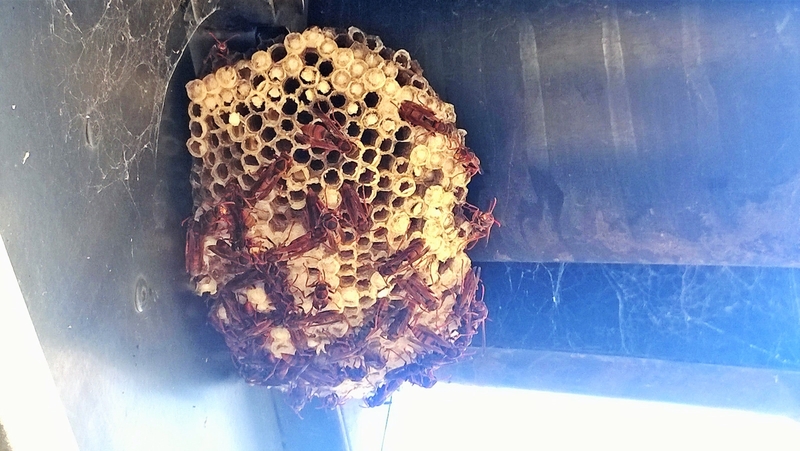 It’s recommended that you seek a professional Pest Controller treat Native paper wasp nests during these months. 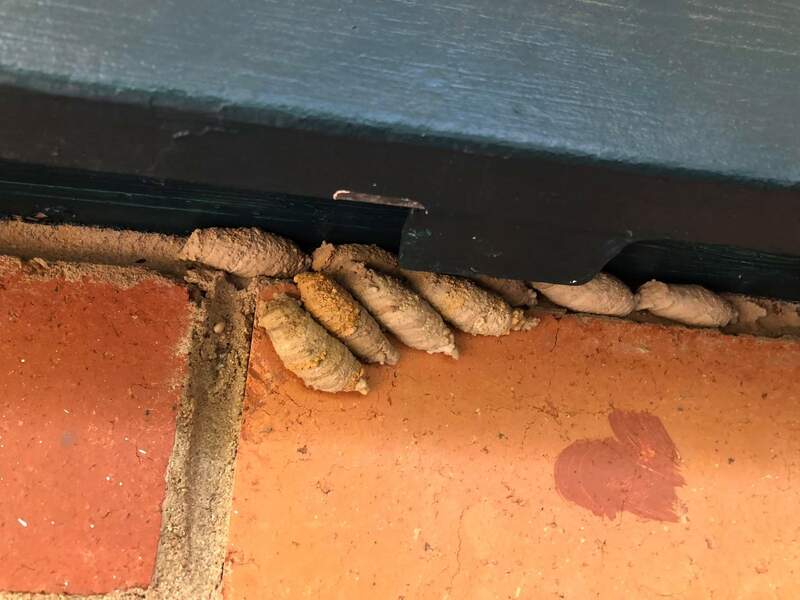 The best time to treat Native paper wasps or the nest is late in the evening when all the wasps are on the nest and activity is low, they are most calm at this time. 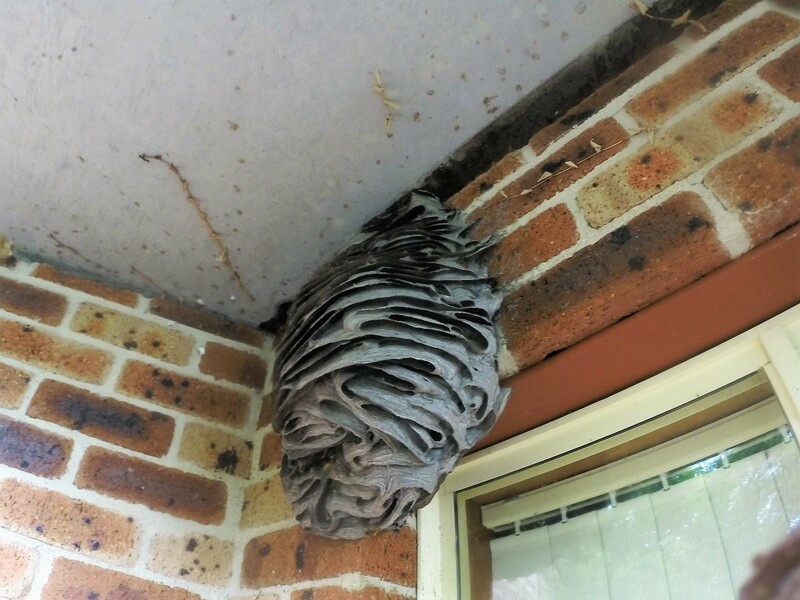 Wear protective clothing when treating a Native paper wasp nest, protective clothing includes a bee veil, hat, long sleeved overalls or long pants, long sleeved jumper/hoodie, gloves and protective eye wear. 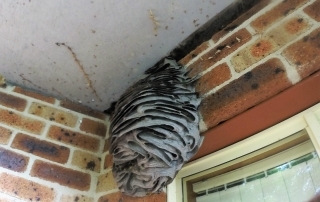 Wind should always be coming from behind you, and blowing towards the Native paper wasps or the nest, holding the registered can of insecticide in an upright position, stand a safe distance from the Native paper wasp nest and not directly underneath the nest, the spray should reach the nest. Spray using a sweeping motion to saturate the nest. 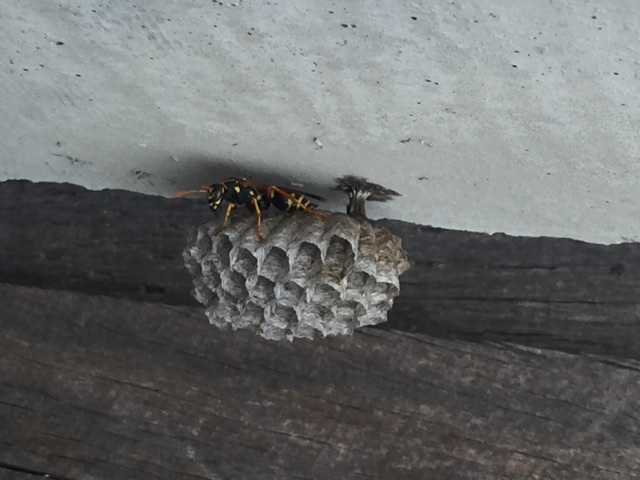 When the Native paper wasps are dead, you can remove the nest by hosing it down or knock it down with a stick. 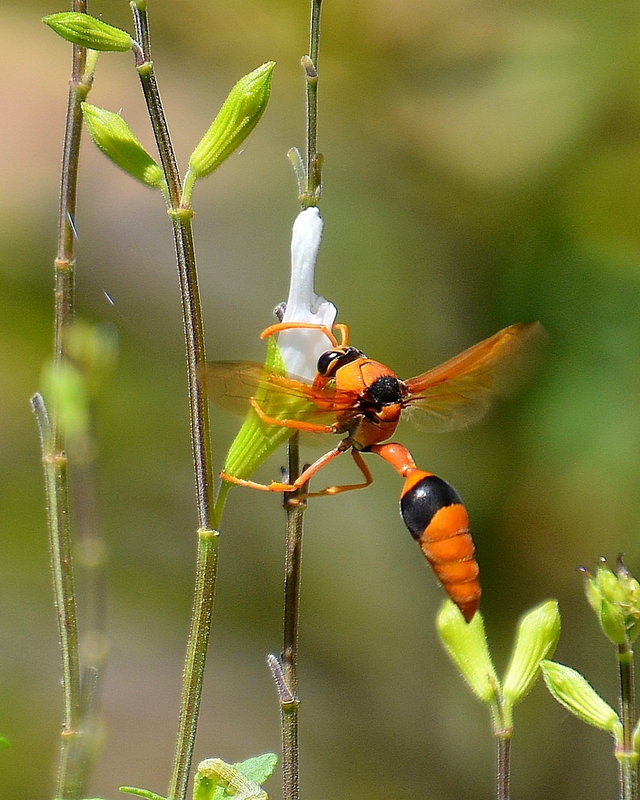 Get to know the Sand Wasp Bembix sp. Size of a sand wasp is around 20mm. 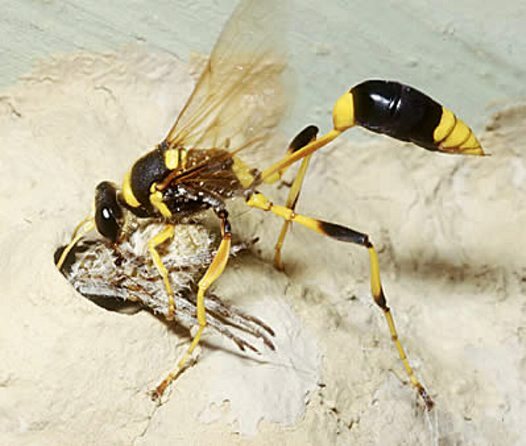 Most sand wasps are yellow and black or white and black, often with a banded pattern. Many sand wasps have pale greenish markings. The sand wasp’s habit of hovering uncomfortably close to a person is for the purpose of catching flies which are attracted to that individual, it is often mistaken for aggression. Adult sand wasps feed on nectar. The wasps hunt for flies and other insects to feed their larvae. Sand flies dig burrows in sand where they lay their eggs. 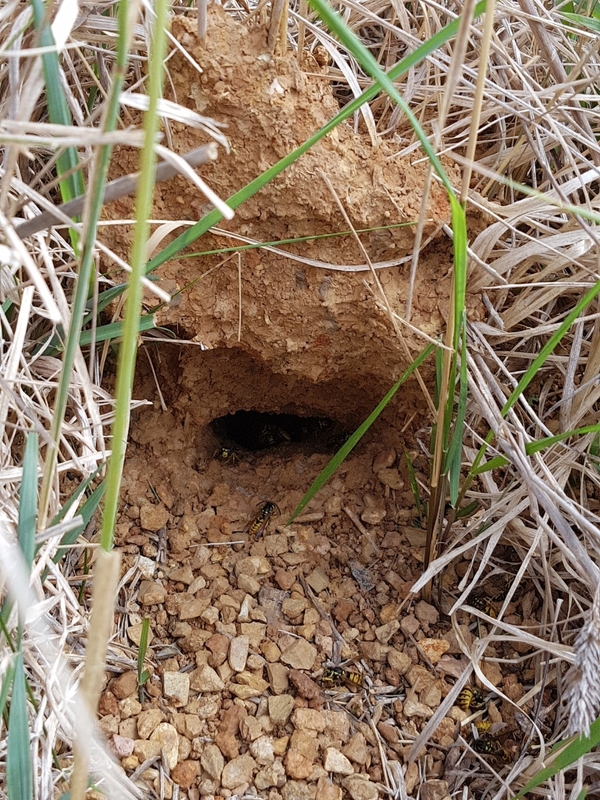 The adult sand wasp will stock/fill the burrow with paralysed insects and cover up the burrow. When the larvae hatch, they feed on the paralysed insects in the burrow. 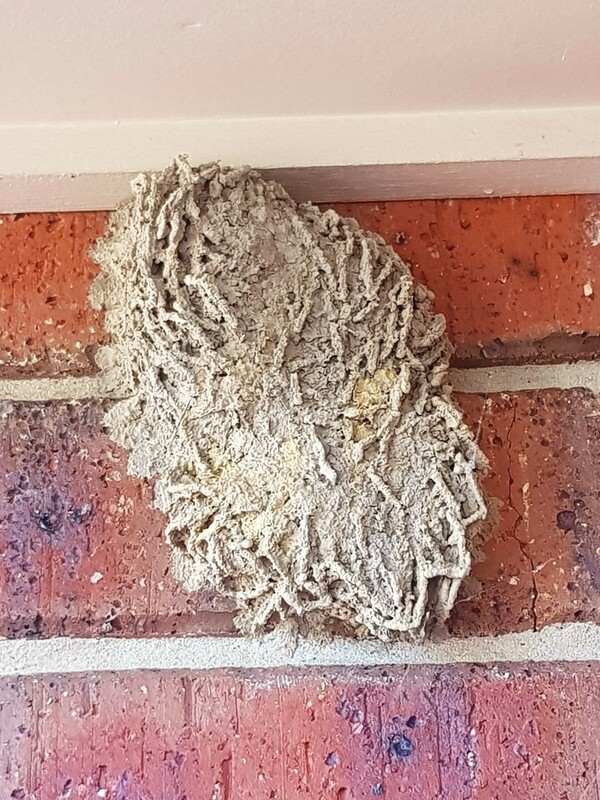 Sand wasps are found throughout Australia. 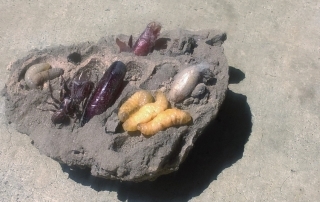 Sand wasps live in urban areas, forests and woodlands. Sand Wasps are solitary hunting wasps that nest in loose sand in a sunny location. They are not aggressive wasps and will not attempt to sting if you approach them. 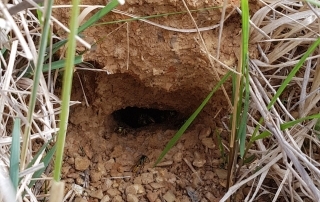 They hunt for insects (some species hunt only certain species of flies) which they paralyse with their sting and drag down sand burrows to feed the larvae. They are excellent hunters, capturing flies on the wing, paralysing them with venom in mid-air and carrying them back to the waiting larvae. Although sand wasps may nest in a group, they do not share labour unless the nest needs defending, in which case they may attack as a swarm. 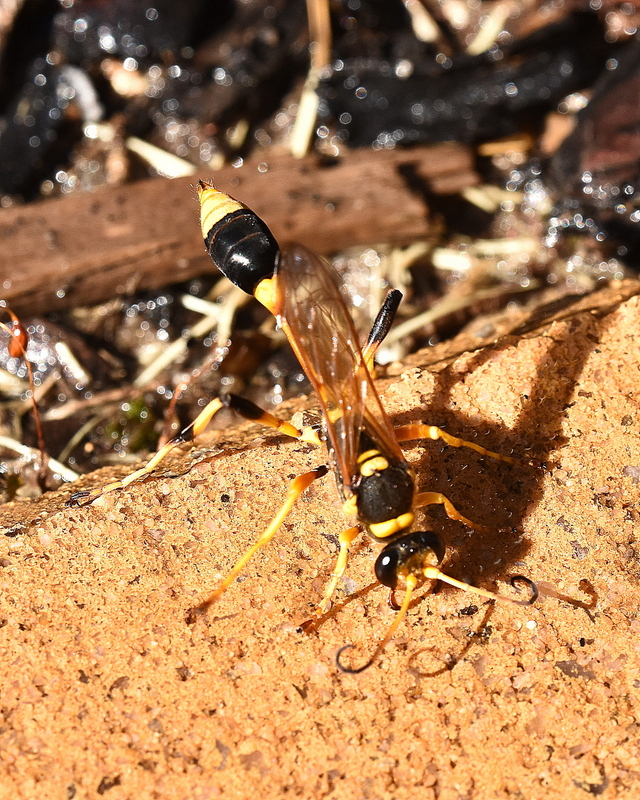 The Sand wasp is native to Australia. 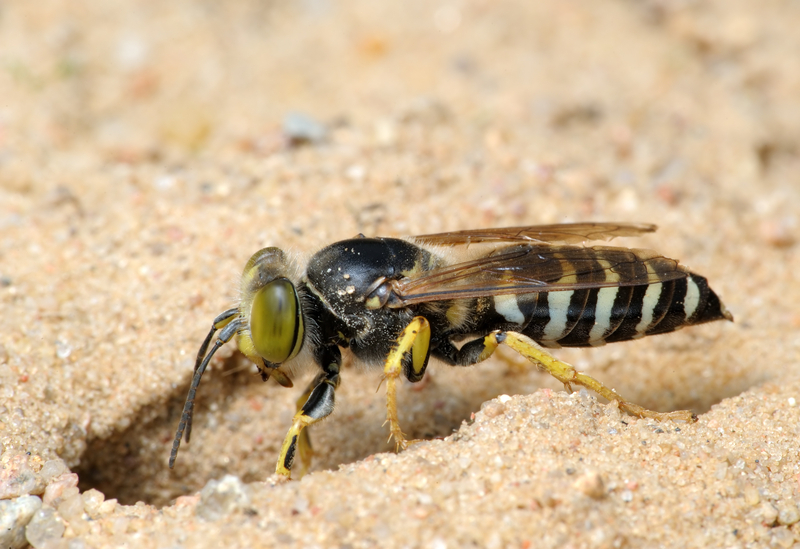 The sand wasp is beneficial to the environment as they control spiders, aphids and other pest insects. If the nest is not in a high traffic area or no one in the household is allergic to bees and wasps, they are good to have around. 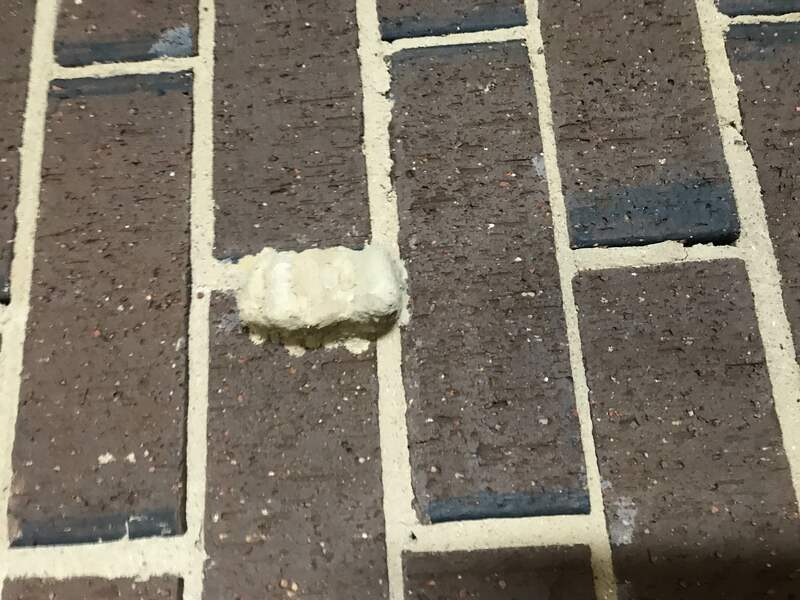 The sand wasp will defend their nest very aggressively. 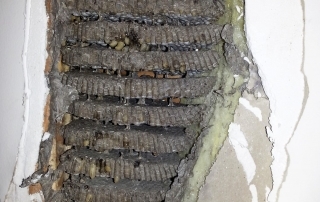 It’s recommended that you seek a professional Pest Controller to treat a sand wasp nest. 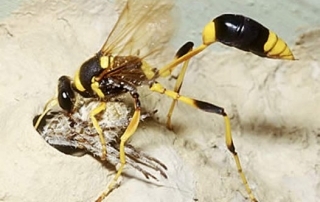 Sand wasps can deliver painful stings, but are not as aggressive as the European Wasp. They normally only attack humans if their nest is disturbed. An ice pack may be used to relieve the pain of the sting. If there is evidence of an allergic reaction, medical attention should be sought immediately. The Sand wasp is beneficial to the environment as they control spiders, aphids and other pest insects. If the nest is not in a high traffic area or no one in the household is allergic to bees and wasps, they are good to have around. 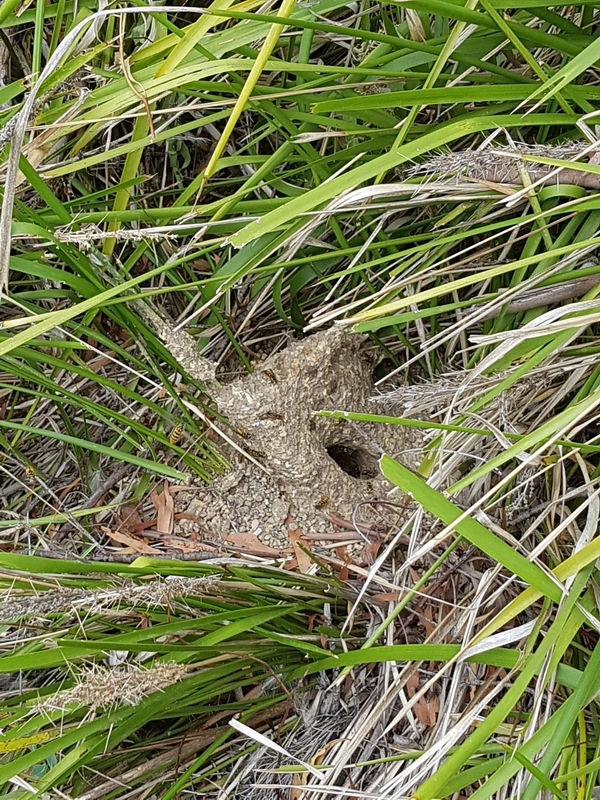 The best time to treat Sand wasps is when they are hovering over the nesting site, if they are in the ground, they will not get the chemical on them. 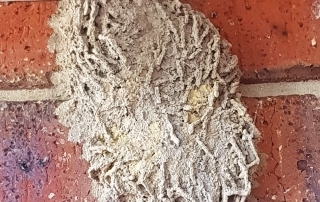 Wear protective clothing when treating a Sand wasp nest, protective clothing includes a bee veil, hat, long sleeved overalls or long pants, long sleeved jumper/hoodie, gloves and protective eye wear. Wind should always be coming from behind you, and blowing towards the Sand wasps or the nest, holding the registered can of insecticide in an upright position, stand a safe distance from the Sand wasp. Spray using a sweeping motions to spray the sand wasps. Size range of mud nesting wasps is 5-30mm long. The most predominate mud wasps colouring ranges from orange/black to yellow/black. 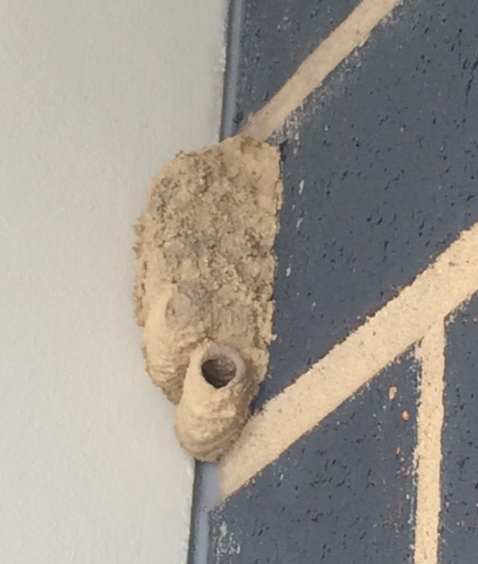 Mud nesting wasps are the most commonly encountered wasps throughout Australia. 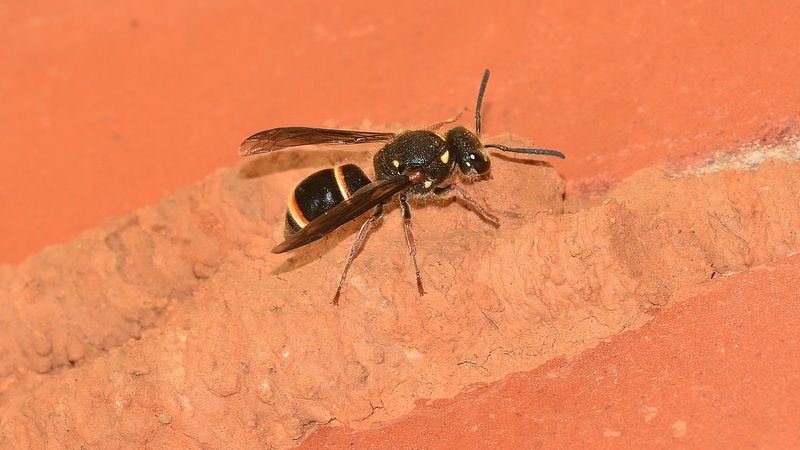 There are many species of wasps referred to as mud nesting wasps; some other common names are Dirt-dauber, Organ pipe, Spider, Vase, Mud-dauber and Potter wasps. The body shape is usually “thread-waisted” with some mud nesting wasps possessing an extremely long and thin, stretched out looking, body segment located between the thorax and abdomen. Mud nesting wasps complete one or two generations per year, depending on the species. 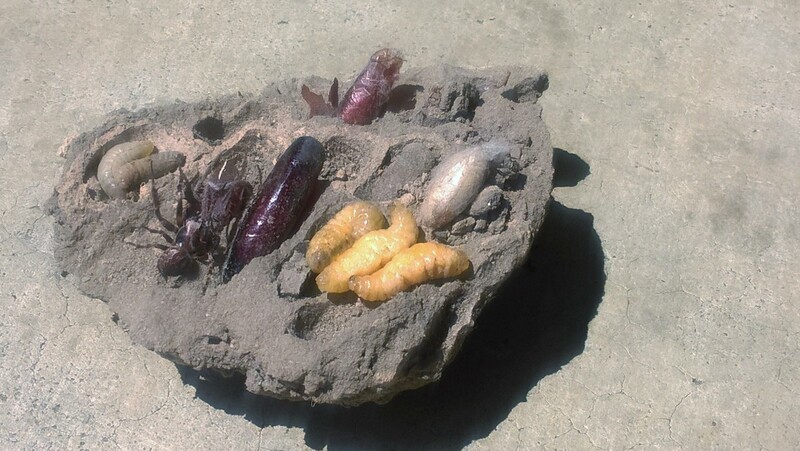 In the spring, the overwintering pupae (cocoon) develop into adults. The new adult females begin building a new nest. 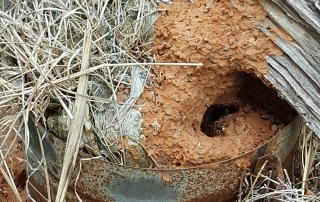 After completing the mud nest, they begin to capture insects and/or spiders that are placed into each mud nest cell. Some mud nesting wasps sting and paralyse spiders, eggs are deposited on the prey within each cell, then the cell is sealed with mud. The larvae that hatch from the eggs and feed on the prey left by the adult wasp. Some mud nesting wasp species, e.g. Spider wasp, dig burrows using their long spines on their front legs and then search quickly on the ground and around trees for spiders. There are four stages in the mud nesting wasp’s life cycle, egg-larvae-cocoon-wasp, from egg to wasp takes around 3 weeks. Mud nesting wasps are solitary wasps. Some mud nesting wasp sp. 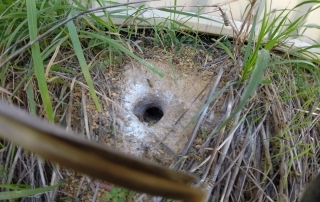 is often seen digging in sandy soil and dragging huntsman spiders along. Some species are known to bite off the legs of larger spiders, trimming them in order to make them easier to handle. Mud nesting wasps’ prey on spiders and insects to feed their larvae and/or will parasitise other mud wasps to feed their larvae. Some mud nesting wasps have scales that help them walk on spider’ webs, allowing them to sneak up and attack the spider. Mud nesting wasps will prey upon small house spiders to larger spiders like a Huntsman spider. 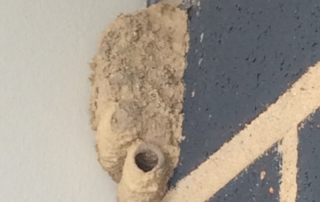 Mud nesting wasps do not form colonies to defend nests and are not aggressive. 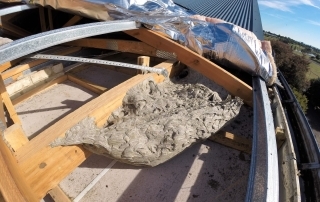 Mud nesting wasps live in urban areas, forests and woodlands. Adults feed on plant nectar, honeydew and the body fluids of spiders and insects they capture. 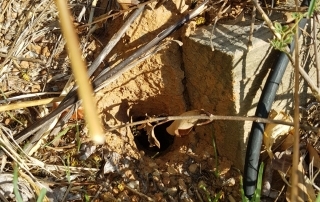 Mud nesting wasps are active in gardens during spring/summer months. Mud nesting wasps can deliver a painful sting; however, they are not aggressive and are unlikely to use their venom on humans unless extremely provoked. If stung, an ice pack may be used to relieve the pain of the sting. If there is evidence of an allergic reaction, seek immediate medical attention. 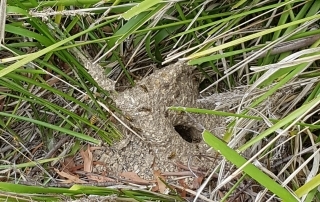 Mud nesting wasp are native to Australia. They are beneficial to the environment as they control spiders, aphids and other pest insects and are also pollinators of native plants. 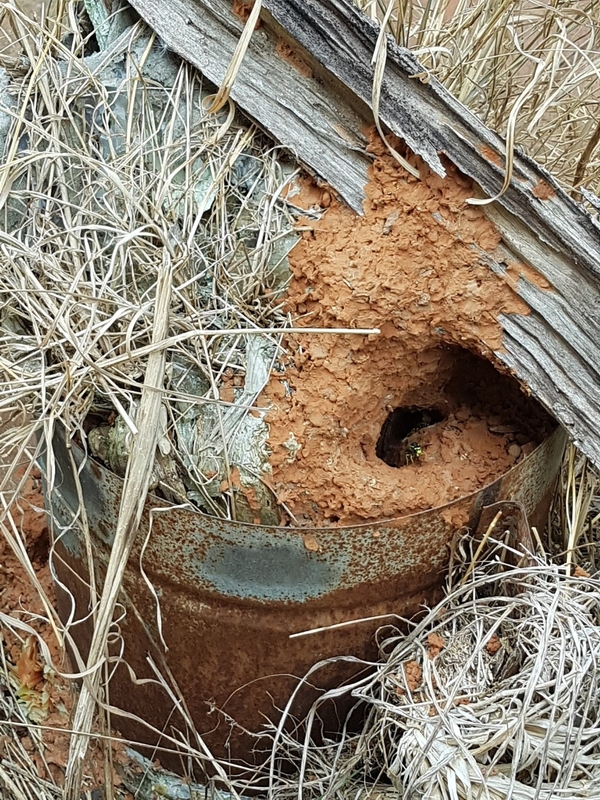 The Mud nesting wasps is beneficial to the environment as they control spiders, aphids and other pest insects and are also pollinators of native plants. If the nest is not located in a high traffic area and no one in the household is allergic to bees and wasps, they are good to keep around. 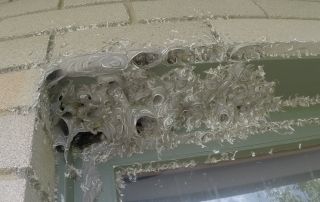 The best time to treat Mud nesting wasps or the nest is late in the evening when wasp activity is low. 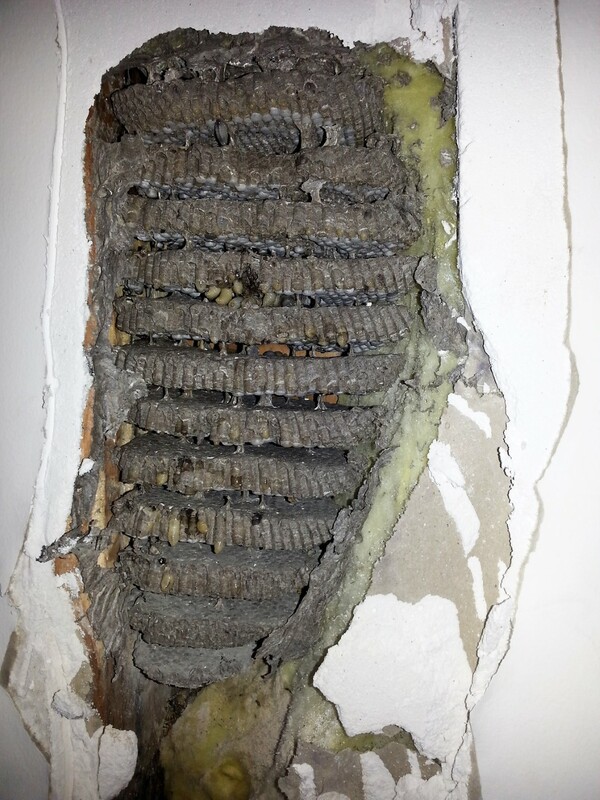 Mud nesting wasps tend to rest overnight under bark, leaves, crack or crevices but may also be found on their nest. 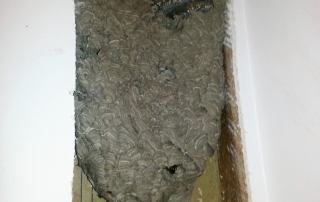 Before removing the nest, be sure the wasps are not on or in the nest. 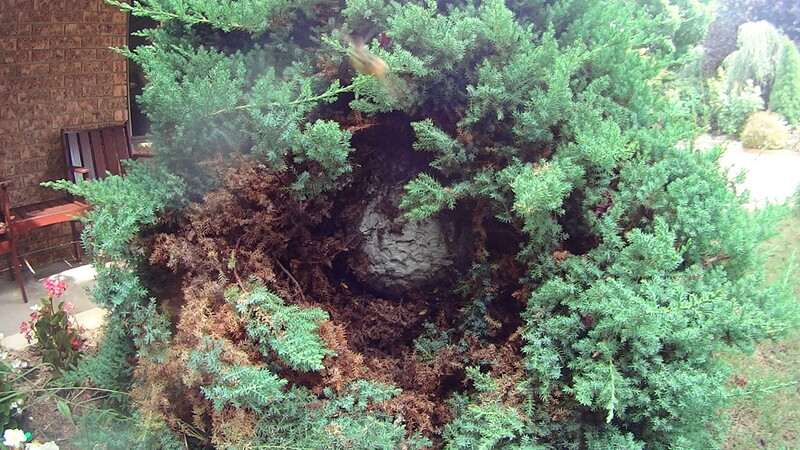 If the wasps are on the nest, you need to destroy the wasps first, (see How to apply insecticide). 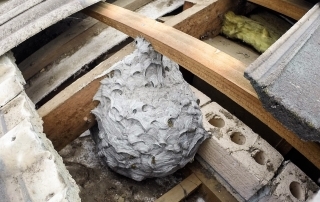 Once the wasp is gone/destroyed, you can wash or knock down the nest. 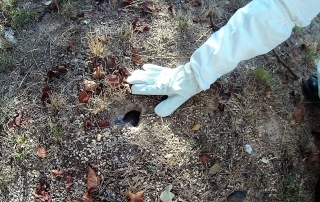 Wear protective clothing when treating a mud nesting wasp nests; protective clothing includes a bee veil, hat, long sleeved overalls or long pants, long sleeved jumper/hoodie, gloves and protective eye wear. 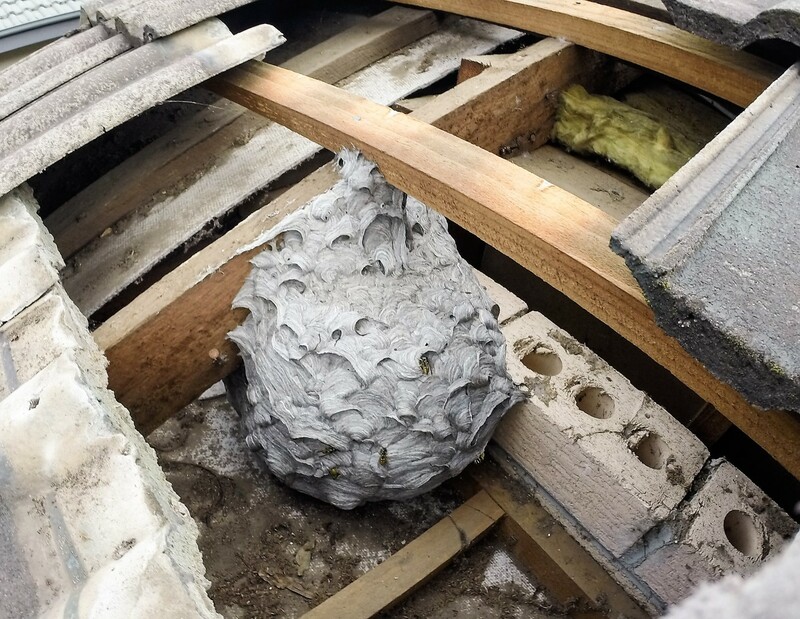 When the wasp is not present, the nest can be knocked or hosed down, this should deter the wasp from coming back and going elsewhere to make a nest. 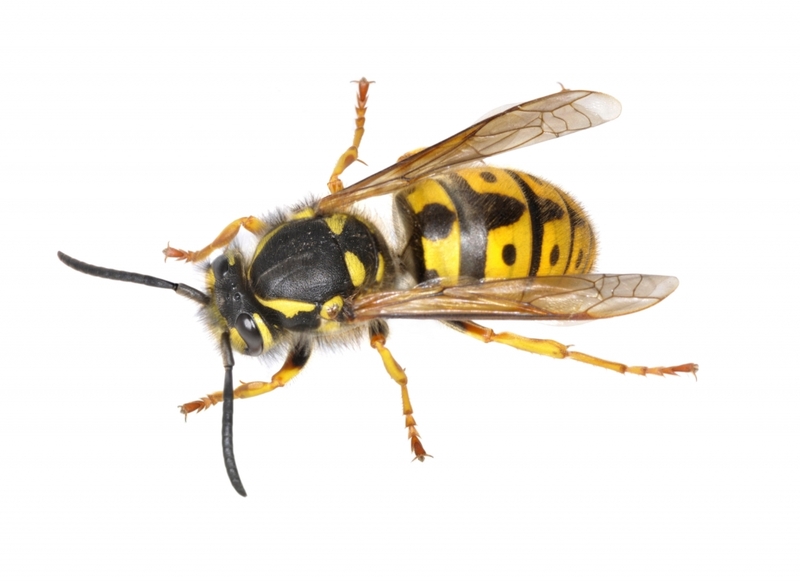 If the wasp is persistent, it may require a chemical treatment. If chemical treatment is required, please follow the directions on the label. When the Mud wasp is dead, you can remove the nest by hosing it down or knocking it down with a stick. Any old nests can also be removed. Note: Old mud wasp nests are reused by other native insects e.g. native bees and spiders.